Spoiler alert: A formal opinion announced earlier this week by the U.S. Department of Justice does NOT ban all forms of online gambling. If that conflicts with what you thought you read, it does. Bloomberg headline: “U.S. Now Says All Online Gambling Illegal, Not Just Sports Bets.” Bloomberg has since altered its headline to more closely reflect reality, but some damage was already done. First off, bettors across the U.S. have been gambling online on horse races for many years, and no one thinks that The Wire Act – nor any interpretation – impacts them. The Interstate Horse Racing Act of 1978 passed by Congress opened the door for simulcasting across the U.S. In 2006, the Unlawful Internet Gaming Enforcement Act (UIGEA) exempted horse race simulcasting from its limitations. But if that was the only error this week, it wouldn’t be so bad. The real problem is with the confusion the headlines have created surrounding sports betting, online poker, other forms of online casino gaming, and state lotteries that utilize the internet. I have yet to come across a gaming law expert who agrees with any of those headlines, and some find the Opinion virtually irrelevant. The consensus seems to be that intrastate online gambling in many forms is not impacted by the new Opinion, which doesn’t have the weight of Court decisions that seem to contradict the memo. The gloomiest scenario notes that a literal interpretation of “interstate” could be stretched to include electronic servers and payment processing, which, if only momentarily, “cross state lines.” That could even be stretched further in a more extreme reach to include a state lottery ticket bought at a 7-Eleven. But even that gloomy picture wouldn’t make the overbroad headlines accurate. Still, make no mistake: headlines aside, the Opinion has legitimately caused concerns in the U.S. gambling industry. The online poker compact among New Jersey, Nevada, and Delaware is one example, although there are conflicting opinions on the impact there. Powerball or MegaMillions sales online – is that at issue? What about payment processors like PayPal, which were hesitant to reenter the NJ online gambling market. Will they be spooked by the decision and pull out? It’s notable that this news first leaked out after business hours on Monday night – yet the Coalition to Stop Internet Gambling put out a widely-distributed press release just an hour later that may explain a lot. 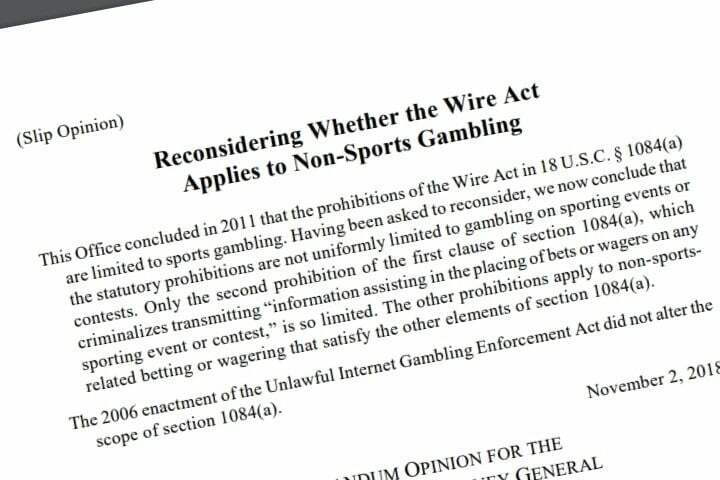 Note how the phrase “federal law prohibits all forms of internet gambling” meshes nicely with those headlines – many of which hit the Internet not long after that. Note “interstate or foreign commerce.” Not intrastate. the correctness of today’s opinion, which weighs in favor of our change in position…. In other words, maybe it’s time for the courts and/or Congress to step in and resolve these issues once and for all – something I concurred with in this week’s podcast. Consider that all of this melodrama traces back to a federal bill signed into law by President John F. Kennedy. DOJ got that part right. It’s time.